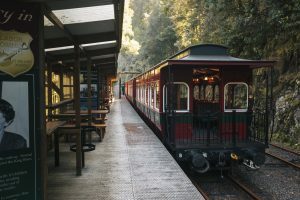 The West Coast Wilderness Railway, Tasmania is a reconstruction of the Mount Lyell Mining and Railway Company railway between Queenstown and Regatta Point, Strahan. Train fans are not left out in Tasmania – so many fantastic stories and adventures await. 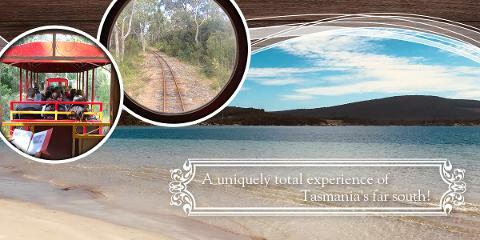 If you are travelling to Tasmania and love trains and railways, you’ll be spoilt for choice in finding places to visit. At all ends of the state you’ll find either rail history, train experiences or tributes to the history of rail travel in museums. Tasmania has a strong history of rail travel and you’ll find a strong community of volunteers and enthusiasts keeping the Tasmanian rail story alive. From steam to diesel engines you’ll be sure to enjoy exploring Tasmania’s train experiences. Image thanks to Paul Fleming. 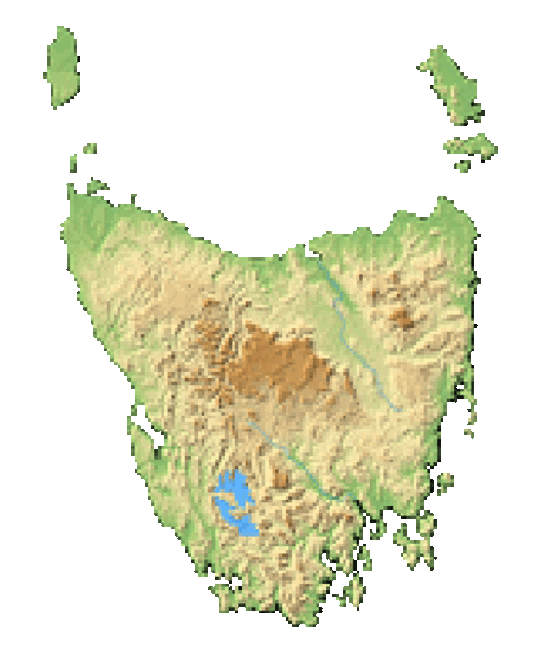 Tasmania is a large island with large distances between settlements. Rail has been used across Tasmania for passenger travel and largely for transport of goods, particularly to remote access areas where roads were not reliable. The West Coast Wilderness Railway is a popular steam train attraction that runs on the west coast from Queenstown to Strahan return. A full or half day experience, visitors will be treated with access into some of the most picturesque parts of the West Coast and through amazing rainforest and bushland. The journey includes great activities such as short walks through the forest, panning for gold, honey tasting and viewing the manual turning of the engine at the end of the line. The West Coast Wilderness Railway is a great family-friendly experience and a must-do tour on the west coast. To get there you’ll need to travel to Queenstown, a 3 hour 45 minute journey from Hobart, or 3 hours 20 minutes from Launceston. Image thanks to Tourism Tasmania & Nick Osborne. The gorgeous Ida Bay Railway takes visitors from the bush to the beach on a brilliant 2-hour journey that lets you explore a beach that is otherwise inaccessible in the deep south of Tasmania. The railway was originally used to transport limestone to Ida Bay where it was shipped, however since 1977 it has operated as a tourist attraction. 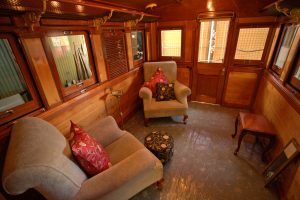 You’ll see amazing pioneer and Aboriginal history, bay views and button grass plains from the restored passenger car that is a bogie flat wagon which was built in the 1890's. 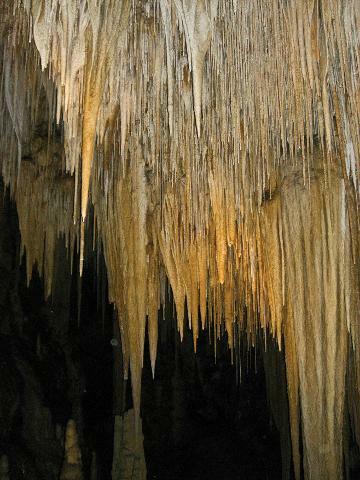 Found 1 hour 40 minutes south of Hobart via the Huon Highway, you’ll be enchanted by this fantastic experience. Image thanks to Tourism Tasmania & Dan Fellow. The Don River Railway, located in Devonport is a fantastic volunteer passenger train service with vintage rail cars pulled by restored diesel or steam trains. 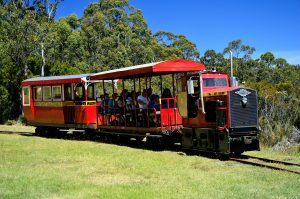 A fantastic family day out, the 30 minute ride provides visitors with an insight into rail on the northwest of Tasmania where the rail lines ran along the coast. The Don River Railway takes you to the beautiful Coles Beach and is a great place to visit when travelling with children with picnic areas and playgrounds to enjoy. 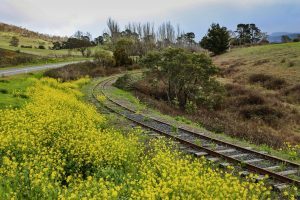 Located 5 minutes from the centre of Devonport or 1 hour 15 minutes from Launceston, you’ll really enjoy all that the Don River Railway has to offer. Image thanks to Tourism Australia & Graham Freeman. The Launceston Tramway Museum transports visitors into the past through delightful photographs showing the trams that used to transport passengers through this city. Located in the lovely Inveresk Precinct, the Tramway Museum features a double bogie tram and the chance to take a short tram ride that transports you back in time to the 1940's. The Launceston Tramway Museum is located in the Inveresk Precinct along with the Queen Victoria Museum, Cafes and University of Tasmania buildings. A 4-minute drive from the centre of Launceston, this is a great stop when exploring this historic city. 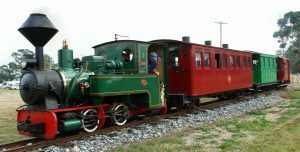 The Red Water Creek Steam Railway gives visitors the chance to ride a steam train and wander through the Machinery Museum and the Model Railway Club. A volunteer run centre, the trains generally run on the first weekend and third weekend of each month. The Redwater Creek Steam Railway and Heritage Society host SteamFest Tasmania each year, a country festival dedicated to steam engines and machinery. Found in the gorgeous setting of Sheffield, a 30 minute drive south of Devonport or just over an hour to the west of Launceston, the Redwater Creek Stream Railway is a fantastic stop in this quaint town. Image thanks to Tourism Tasmania & Supplied Courtesy of Kentish Council. Wee Georgie Wood Steam Railway shows visitors through the small town of Tullah on a 20 minute train ride through spectacular west coast scenery. This railway demonstrates just how important rail was to the isolated communities in the west as this 2ft gauge railway was the only way to access Tullah. The Wee Georgie Wood is a 1924 steam locomotive that has limited opening hours during the summer months. When the train is not operating, visitors can take a self-guided tour of the site. Tullah is found on the way to the West Coast, 1 hour 15 minutes south of the coastal city of Burnie or one hour 45 minutes from Devonport and the Spirit of Tasmania dock. Railtrack Riders is a unique experience that takes riders through a 16 kilometre track of historic railway using pedal propelled cars. 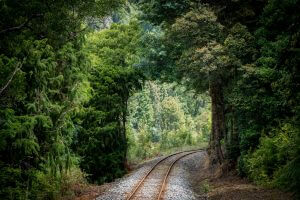 Travelling on the historic 1067mm gauge railway, your small vehicle will take you on a journey where you’ll experience the beauty of the rainforest and that fantastic eucalyptus forest smell. This trail runs between Mount Field National Park and Maydena and has different ride options of various lengths and destinations. Visitors can start their journey either at Maydena or Mount Field National Park, both located approximately 1 hour 30 minutes north-west of Hobart. The Derwent Valley Railway has 11 locomotives which are mixed between steam, diesel-electric, diesel-hydraulic and diesel mechanical with 9 carriages and 11 wagons. Volunteers guide visitors through the display and discuss how this community group restore and maintain this wonderful collection. The Derwent Valley Railway is found in the beautiful riverside town of New Norfolk, a 35 minute drive northwest of Hobart in the south of the State. Image thanks to Tourism Australia & Graham Freeman. The Tasmanian Transport Museum is a wonderful display of a wide range of restored locomotives, wagons and carriages, trams and even buildings, including the Station Master’s Office and a signal room. Steam Train and Diesel Railcars operate on different weekends, giving visitors the opportunity to experience different demonstrations of rail power. The museum also houses a historical display of photographs and is open each Saturday and Sunday. Located in the south of the state in the suburb of Glenorchy, 15 minutes north of Hobart, the Tasmanian Transport Museum is a must see for train enthusiasts.